Finding just the right location with just the right Cleveland caterer can be a real challenge – especially if you have a large group. If you are looking for a site that can accommodate up to 325 people, then you’ll be excited to hear about the relationship that Special Moments Catering has with the Parish Center at Our Lady of Perpetual Help. Centrally located in Aurora, at 342 South Chillicothe Road, Special Moments Catering is the exclusive caterer for the location. With a large hall that can accommodate weddings, anniversary parties, retirement parties, community fundraising events and even business events, the Parish Center is conveniently located near Cuyahoga, Portage and Geauga counties. Why have your event at the Parish Center? Special Moments Catering will allow you to bring your own sound company, lighting, decorators, desserts and most importantly the alcohol, which may save you thousands of dollars in bar fees. In addition, the layout of the facility is conducive to having several meeting or dining areas. Multiple rooms allow you to host breakout sessions or even offer a variety of lectures. Open seven days a week, the Parish Center is ideal for Sunday parties and offers a unique layout that will intrigue your guests. The main hall is three stories high with one end completely encompassed in glass. Located on a wooded lot, the teardrop shape of the room is visually interesting and will keep your guests riveted on the outdoor environment. The surrounding grounds feature newly installed gardens, stone walls and walkways, making the perfect backdrop for pictures. the Parish Center is just one of the many locations where Special Moments Catering can provide service. For more information on the Parish Center or for other options as to where to host your next event, contact us today. Thanksgiving can be a wonderful time of the year to get married. If you are planning a Thanksgiving wedding then you can expect to have a family-centered time of celebration. Caterers in Akron, Ohio, have some amazing suggestions for making your Thanksgiving reception a time to remember. Most couples who are choosing wedding reception catering at Thanksgiving are looking for a traditional dinner that reflects not only who they are, but the importance of the season. You can certainly start your meal with a variety of fruits and cheeses that reflect the harvest theme of the season. A roasted acorn squash soup can be a lovely way to warm the stomachs of your guests. Another Thanksgiving appetizer that Cleveland caterers can offer is seafood served with an apple-based sauce. For the main course, having a roasted turkey and gravy is an option that will cater to the traditional side of Thanksgiving. Caterers Cleveland also suggest having another main course as well, whether beef wellington, a variety of artisanal sausages or even roasted ham. Adding another main course will give your wedding a lush feel that a normal Thanksgiving doesn’t have. If you are looking for a novel way to celebrate your wedding, consider offering a turkey pot pie with mashed potato crust. 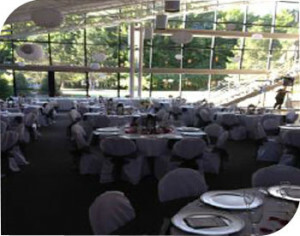 Caterers Akron have discovered that this is a popular option for celebrations. Side dishes are a place where you can show your style. Instead of offering the expected, try something new. Mashed potatoes combined with roasted garlic or white cheddar cheese can be a welcome surprise. 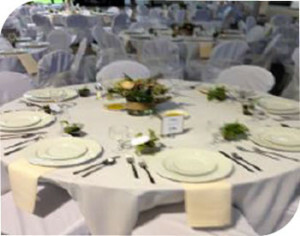 Caterers Cleveland also suggest offering roasted green beans with almonds or even a grilled romaine salad as an option. A sweet potato souffle can be a great way to lighten up the potato portion of the meal. For dessert, don’t forgo the wedding cake. Try offering a carrot cake pr spice cake as your wedding cake, covered fondant and filled with cream cheese or maple nut compote. You can even offer a pie bar or decadent desserts such as pumpkin or chocolate hazelnut mousse. Bowls of sweetened whipped cream and ice cream can make your wedding dessert a success. Having a Thanksgiving wedding can make memories that can last a lifetime. By taking the traditional Thanksgiving menu and adding a twist, you’ll show your style and tie it into tradition. Planning a Thanksgiving or other holiday event? Call Special Moments Catering today for ideas on how to make your event truly memorable.